How Do I Determine My Head Size & Hat Size? I sell my hats by your Head Size in inches. This is unique but far more accurate. It does rely on you (maybe with help from a friend) measuring your head. Please don't guess! Use a soft tape measure and measure snuggly to the nearest 1/8 inch the widest part of your head just above the ears and about 1" above the eyebrows: Blue line on the face below. (**No tape measure? Use a string or even a cell phone charging cord and then lay on yardstick**). The bigger the brim, a tighter the fit will be required to prevent hat moving. 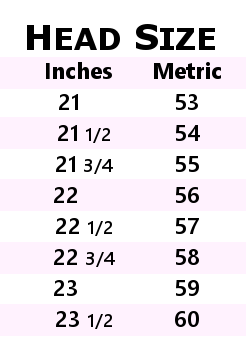 Please Note: Ladies hat sizes (from extra small to extra large) can vary according to hair style, head shape (please read Hat Style Page too) weight gain/loss or age, so please remeasure your head even if you have ordered a hat before. My women's hats are sized in inches. Ladies hats are like ladies clothing and size can vary with style also. I will do my best to match your measured size to the hat size. If your head size is in between or different from size offered for the hat you are choosing, please note your ACTUAL size in the "Comments" section of your order. I can adjust most hats a 1/2 inch or so. 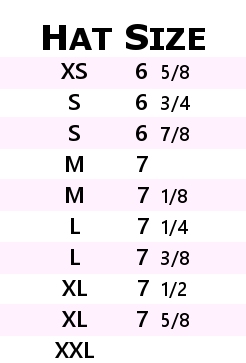 For sizes larger than 23 inches, styles are limited. For in between sizes and usually XS (UNDER 21 INCHES), I will include a self-adhesive terry sweatband which reduces the size of the hat by 1-2 sizes. These make the hat very comfortable and prevent it from slipping. Please contact me if you are in doubt about size so I may work with you personally. PLEASE NOTE: When browsing catalog, many styles are available in limited sizes.